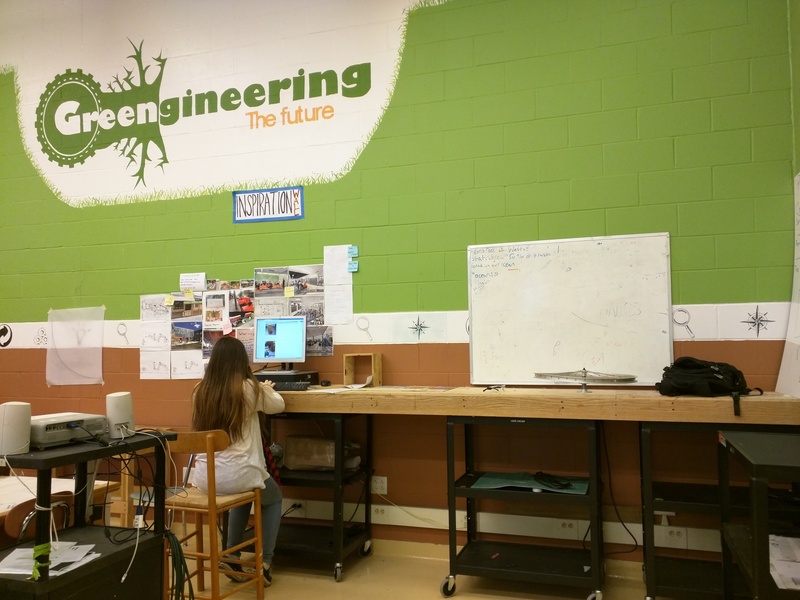 When you enter “Newton’s Lab,” the eponymous workspace for NNHS’ Greengineering program, your eyes wander around the room as you try and take in everything that contibutes to the organized chaos that is somehow curiously calm. Students stand around workstations with supplies strewn about. 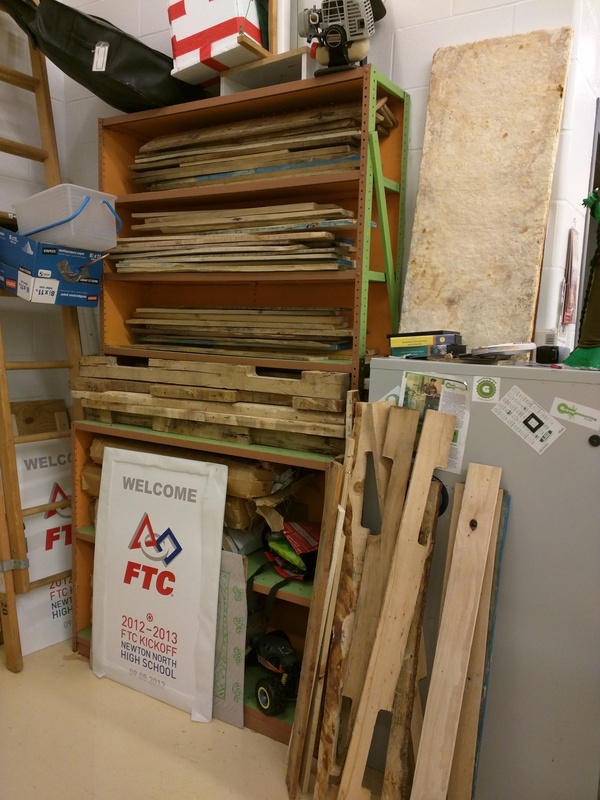 Ceiling-high storage shelves are stacked with totes labeled “awesome projects only” or “random rigids.” There’s rolling storage, industrial shelves, and makeshift benches that founder Steve Chinosi describes were added on as needed. It’s like a living, breathing archive of ongiong projects taken on by the ambitious students in this progression of elective courses that blend engineering, sustainability, chemistry, and everything in between. 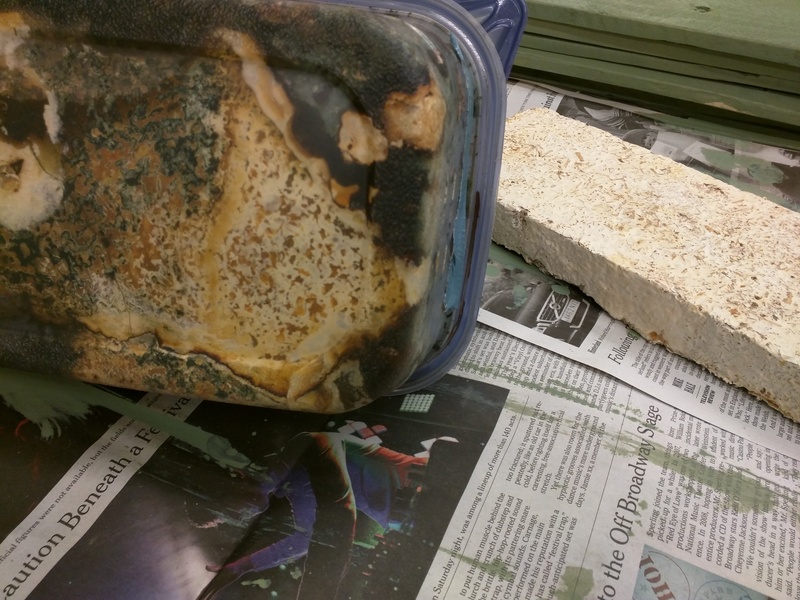 Three year old mycelium (left) compared with the mycelium foam core (right). Students persuaded Steve to keep the moldy version and they’ve noticed activity between the bacteria and fungus that are unique discoveries. In their first design year, students tend to pick a focus area in something like biofuel or plastics and dive deep to generate areas of interest or problems to solve. In the nine-year history of the program, the amount of unique work is impressive and almost overwhelming, but Steve, who’s a former English teacher, can explain much of the complicated science behind these projects. Students often bring in ideas they find on YouTube or Kickstarter, which is how the mycelium research began. While explaining exactly how mycelium (part of a mushroom) binds with sawdust to make an alternative to styrofoam, Steve happlily said of foraying into the unknown, “it’s infinitely better being a co-pilot than a director.” He really is along for the ride and with students as the driver, teachers leaving necessary space for students to impress is often scary, but beyond rewarding. The mycelium project has been picked up and expanded upon since the initial student interested used it as the core for a surfboard. The breakthroughs made with mycelium have never been published before and a former student, now in college five years after the initial research, will be the first to do so. I commented that this would usually be the type of thing done by a graduate professor because of the time required. “We’re putting kids in that conversation and figuring out ways to make projects that live on,” said Steve. Another ongoing project has changed throughout the years, but focuses on extracting algae oil, something a current team is on the brink of doing. It’s another one that has never been done and this year’s students sought out a Greek professor who had written about the topic to learn more. They gave him a video-tour of the lab and were able to get his feedback on their process. Students were prodded to look for experts, but they were the ones who did the legwork of finding him and getting him “into” the lab. The algae project is a perfect example of a living, breathing project that continues from year to year. Students leave Wikis and Google Docs behind with detailed notes, flowcharts, sketches, and data from their own research so the next team can get up to speed quickly and pick up where the other team left off. The alumni often get contacted by current students to explain parts of what they did and this network of contacts has proven beneficial in many other ways. Another role of Greengineering’s boot camp is for the teacher to watch students work together and feel out what roles they’re likely to want or need to play in teams as the year progresses. By month two or three, when he walks in the room, students are already working on their projects. A mantra he often quotes to students is “leave with questions and come back with answers.” Team time is extremely valuable, so the time spent in the room is used collaborating with others. Documentation on wikis or blogs is often left for out of class time; it’s extremely important work, but it doesn’t require the whole team’s effort. Rolling supply carts have been a helpful, cheap storage alternative for teams. We spent plenty of time talking space, budgets, the necessities, the “nice to haves,” lab safety, and other logistical concerns. One new idea I hadn’t thought of is having team-specific carts that can be stored under benches and easily roll out when the team is in the room. Having rolling art supply storage units that other building teachers can check out and use helps strengthen the relationship between Greengineering and the larger NNHS. Cheap, comfortable seating can be found, but he was quick to note that student requests for bean bags were vetoed in this engineering-specific space, which make more sense in a space used for reading or quiet work. The relationship they have with community and business partners is also impressive. 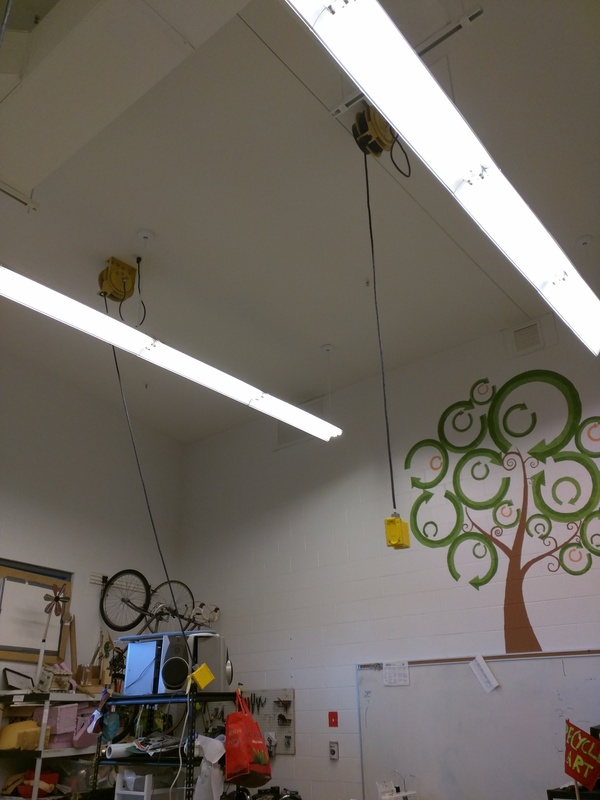 Students have taken on projects for Whole Foods or UPS and connections made through one project often lead to a problem that can be solved in another. MIT is a partner of the program as well and Steve described a recent meeting involving some higher-level admins at the university about movements in education. Fifteen years ago, MIT piloted digital learning before most were doing it and now continue to look fifteen years ahead to what the future of education will be. The general mindset is that residential learning still has a lot of value; humans gathering together to engage in complex thinking in-person seems impossible to replace online. My comment to Steve was that digital learning (Khan Academy, for example) is just an online solution to a traditional educational model. Reimagined educational models like Greengineering turn those models on their head. One of the topics of discussion that came up was whether the changed initially pushed by Steve and then by other early adopters met any resistance. Newton North is a successful school district in the 90th+ percentile, much like Greenwich. Rather than change, it’s much easier to say they were doing a bunch of things right and celebrate them (we, rightfully, do that often). However, if a powerful school district is not continuously looking for improvement, to paraphrase Steve, they are then mediocre in their excellence; while there’s not a bunch of research out there in going from the 90-something to 90-something percentile, that’s not a reason to stay the same. 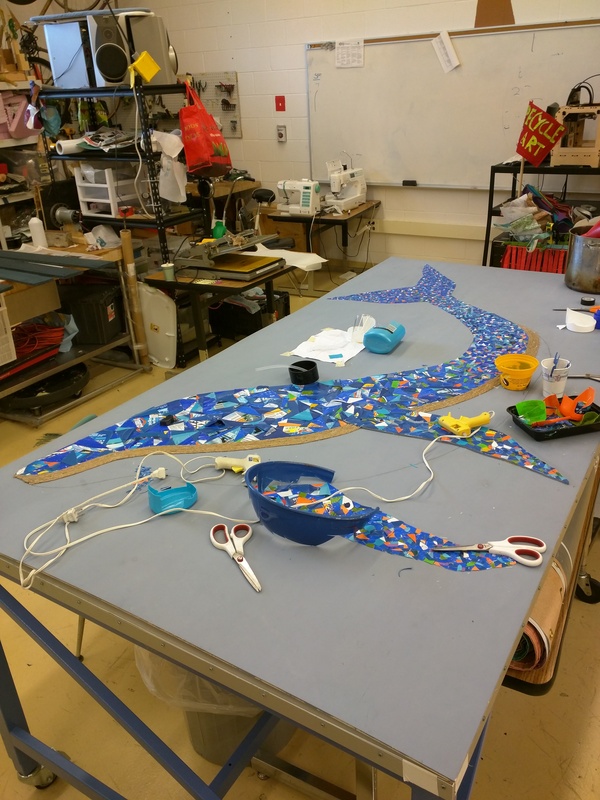 A model version of an artistic component that accompanies a project on Pacific gyres and how plastics break down into small pieces. 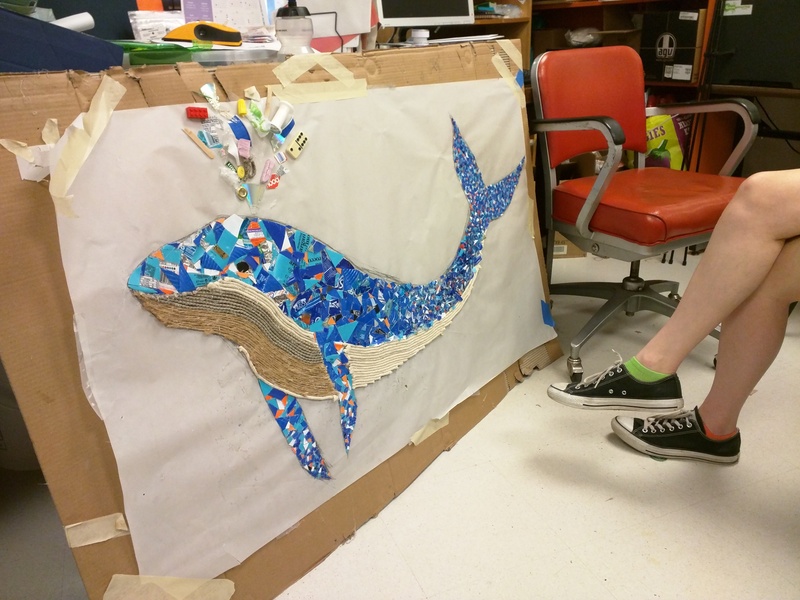 The model will be used even after the larger version is done to explain gyres to elementary school students. Final product (almost done), 4’x8′. Tripping over cords? Ceiling-mounted outlets.